Located near Dayton Ohio, the National Museum of the United States Air Force presents military aviation history in a gallery format, with over 400 vehicles on display in this free to the public museum. 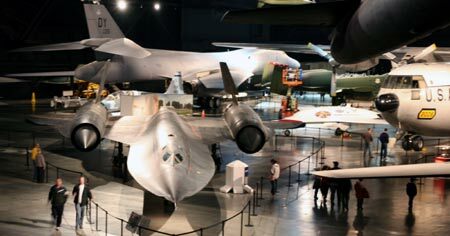 The museum is divided up into 8 major galleries that include Early Years, World War II Air Power, Modern Flight, Cold War, and Missile & Space. The Presidential, Research and Development, and the Air Park are located in other areas. The Air Park is located outside on a nearby runway. The Presidential, Research & Development Galleries are only accessible by bus tours that must be reserved. 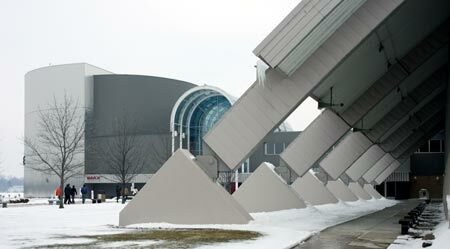 The museum is in 3 large buildings plus the IMAX theater near the front entrance and the Missile/Space Gallery tower. The museum is a large complex with lots of walking. The museum is open 9 a.m. - 5 p.m. seven days a week, except for Thanksgiving, Christmas and New Year's Day. Admission is free. Once there, you are free to walk among the exhibits on your own. Guided toures are offered daily at 1:30 p.m. On Saturdays, guided tours are available at 10:30 a.m. and 1:30 p.m. Tours begin at the entrance. Every Friday you can take the Behind the Scenes Tour at 12:15. You MUST pre-register for this tour prior to Wednesday and be at least 12 years of age (12-18 participants must be accompanied by adult.) A government issued photo I.D. is also required for all participants. 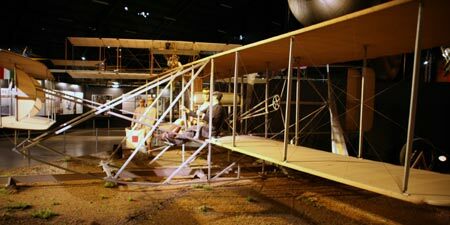 The museum is full of visually strikin exhibits from the early days of manned flight to the present. All exhibits are arranged in galleries of related aviation history. Covers the earliest days of military avaiation up to the first years of World War II. World War II, the United States became an air power that led the world. Includes the use of airplanes in the Korean and Vietnam Wars and the development of unmanned aircraft. This is the latest gallery hangar added to the museum with over 200,000 sq. ft of display space. Includes in an impressive display of Intercontinental Ballistic Missles standing side-by-side. Includes 9 Presidential aircraft and visitors can walk through 4 of the them including Roosevelts, Trumans, Eisenhowers, and Air Force One, the plane that flew President Kennedy's body back to Washington D.C. from Dallas. The Museum has a very large gift shop/bookstore with all kinds of collectibles for all ages. Visitors can find books, apparel, models, music, videos, toys, and artworks that all feature aviation. The base is named after the Wright brothers, who used the Huffman Prairie portion of what became Wright-Patterson as their testing ground, and Frank Stuart Patterson, son and nephew of the co-founders of National Cash Register, who was killed on June 19, 1918, in the crash of his Airco DH.4 at Wilbur Wright Field.